It's been said that Walt Disney World brings out the child in all of us. Among the dozens of rides offered at its parks, however, which ones especially reach out to younger children? Per Walt Disney's grand design, all of the rides at Disney World are made for adults and children to enjoy together. But some of the more thrilling attractions have height restrictions and aren't intended for small fry. And while nearly all of the rides appeal to kids of all ages, some have the perfect blend of whimsy and charm to delight toddlers and pre-tweens. Here are my picks for the ten best Disney World rides for children. Sure, it's similar to simple spinning rides found at amusement parks and carnivals everywhere (although the Disney ride is decked out like some magnificent Renaissance machine designed by Leonardo da Vinci). But there is something affirming and timeless about boarding the famous flying pachyderm. No visit to Disney World would be complete without a spin on Dumbo. 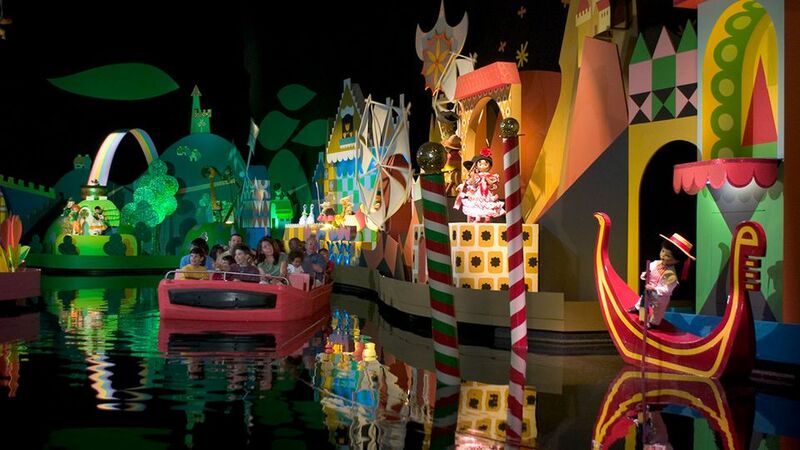 It is, perhaps, the definitive Disney attraction and the best Disney World ride for kids. It's so popular, Disney added a second Dumbo ride when it expanded its New Fantasyland area. It also features a big top circus-themed waiting area where kids can have fun before their ride aboard the soaring elephant. Sensation of flying high in the air. Slightly menacing villains. It's one of the original Disney World (and Disneyland) attractions. The sweet ride sends guests soaring high above London and off to Never Land in flying galleons that are suspended from a track above the vehicles. Disney's other Pirates ride can be a bit foreboding and overhwleming for small children, but Peter Pan strikes the perfect balance of adventure and nostalgia. Who could resist a ride powered by pixie dust? A stunning breakthrough by Disney Imagineers integrates the characters from Finding Nemo with the actual fish and animals in the tank of the marine life pavilion. The illusion will have adults baffled, but young children will simply accept it -- and love it. A sequel of sorts to the film, the simple story has Nemo pretending to be lost (talk about a fish who cried wolf, eh?). The Omnimover system uses cute "clamobile" vehicles. A theatrical retelling of the classic animated film (in condensed form), the show includes many of the movie's popular songs. Kids will root for the upbeat, plucky heroine and be delighted by the in-theater effects. Perhaps the most gentle park ride ever designed. Young kids are wide-eyed as they glide through the Disney park original (which was one of the four attractions Disney developed for the 1964 New York World's Fair). The relentlessly upbeat and bright ride might seem a tad cloying to adults -- and its never-ending theme song can induce fits of hysteria -- but children absolutely adore it. There is an interlude when the room turns dark, and the noise level gets a bit loud. A throwback to the Disneyland attraction that was the first to offer Audio-Animatronics, the charming show features talking birds and flowers as well as endearing, if dated (in a good way) songs. For about ten years, Disney tampered with the show and grafted characters from Aladdin and The Lion King onto the classic show. Fortunately, it realized its update was misguided and restored the nostalgic version. Meanie Ursula might upset young kids in her dark scene. The delightful show has no scary moments. The presentation has no scary moments. Enter a magic mirror and be transported to the Beast's castle. There, you'll encounter The Wardrobe and Lumiere (two mighty impressive animatronic figures) as well as Belle and other characters from the film. The charming attraction is interactive and incorporates many kids in each performance. Rickety bridges and other structures may offer mild thrills to younger kids. The enchanting playground provides a great way for rambunctious kids to blow off steam. There are plenty of nooks to explore and interactive adventures to uncover. The raft ride to and from the island adds to the adventure. The show has no major scary moments. Nemo and his pals are certainly well represented on this list. The third in three exceptionally charming Disney World attractions based on the Pixar film, the show summarizes the lost fish story using oversized puppets manipulated by visible actors. It adds wonderful musical numbers (the movie did not have any songs). The Broadway-quality theatrical production will please audiences of all ages, including little folks.